Goddards Gardens was founded in July 1999 by Jimmy Goddard after having achieved various horticultural qualifications over four years at Easton College near Norwich. 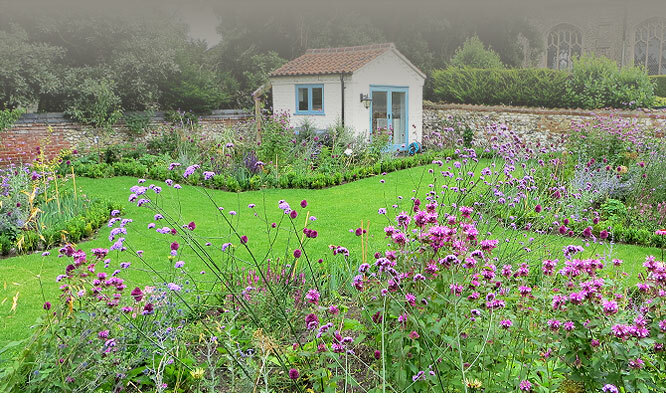 We are a unique company in our sole dedication to creating planting schemes, also known as 'soft landscaping'. This allows us to undertake single border, through to large scale projects. Long term performance of our schemes is important to us. Selecting hardy, reliable plants goes a long way in achieving this. We avoid using invasive or short lived species. A genuine interest in our work motivates us to re-visit past projects some carried out years previously, this provides us with invaluable knowledge on the best long term performing plants and combinations. We have a well equipped nursery at our base in Docking where we hold stock and propagate hard to source plants. The nursery is solely for our project work and is not open to the public. We could not offer the same level of service without this great facility. We are always on the look out for new varieties as these tend have more desirable attributes such as longer flowering period and disease resistance. We have just ordered the new truly perennial foxgloves which won the Chelsea plant of the year and are looking forward to including these within our schemes from 2015 onwards.